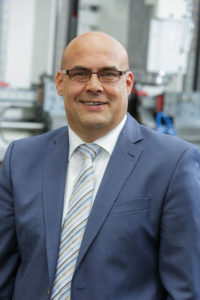 Mr. Woitsch, how long has the retrofit process existed at EMAG? For about 18 years—from the beginning, the work has been performed in Eislingen, approximately 5 kilometer away from the EMAG headquarters in Salach. The plant is broken down into three business units: Retrofits & Used Machines, EMAG Richardon Service Center and a Central Spare Parts Store. A total of 85 employees are busy with these tasks. For you, what falls under “Retrofit”? Retrofitting includes a very broad range of activities. Essentially, it boils down to refurbishing used machine tools and, in doing so, adapting them to changing or new tasks. This can be achieved by integrating additional tool systems, such as drilling, milling, or grinding spindles, or even modifying automation solutions. For instance, our experts can transform an old lathe into a highly advanced turning and grinding center. And this may allow for the production of additional components? Of course! In many cases, customers come to us with precisely this goal in mind and want to know whether they can produce a new component with their old machine. We show how this can be done based on a detailed machine appraisal. Our projects always rely on creating the specifications needed to meet clearly defined goals. Why doesn’t the customer invest in a new machine? There are two obvious advantages: For one, the retrofit solution is about 15 to 25 percent cheaper than purchasing a new machine. Secondly, we generally only need 15 to 16 weeks for the conversion and modernization, making the desired production solution available very quickly. At the same time, there are no compromises in terms of quality—ultimately, it is the same as a new EMAG machine. Do you only use new subassemblies and components for the conversion? No, it depends on the required task. In principle, damaged components can also be replaced with refurbished parts. The subassembly retains its original twelve-month warranty and obviously performs just like a new component. There are absolutely no compromises here. What is the role of the EMAG spare parts service at the Eislingen site? It is very important for the entire EMAG group that a variety of spare parts and standard subassemblies, such as main spindles or turret assemblies, are available for immediate delivery from the warehouse. Allowing the customer to get something, like a working spindle for example, in just one business day – minimizing the customer’s down time. We can work with customers to develop a solution for any defective subassembly. EMAG offers a very broad range of technologies. Are you able to provide a retrofit solution for all areas? Absolutely. Our turn-key service includes all EMAG technologies from turning and grinding, to laser welding and induction hardening, all the way to electrochemical machining. While turning and grinding have been our primary focus in the past, we can reach out to additional experts as needed from the various EMAG technology companies. At the end of the day, there’s always a solution that keeps pace with a new machine. From your point of view, what are the market opportunities for the retrofit service? The opportunities are significant! From an economic standpoint, we make sustainable use of resources when we recondition and recycle machines and materials. We also provide the benefit of speed to production, enabling customers to quickly adapt their production solutions to changing conditions. Machines will increase in overall speed as well, decreasing overall unit costs. Considering the fast past, and quick changes in the automotive industry, our ability to provide a quick turnover is a tremendous advantage. And this isn’t just a benefit available for our European customers! If you’re located in the United States, Canada or Mexico – contact EMAG L.L.C. to inquire about retrofitting for your used machinery.